In the last 20 years NASA has been turned from a space agency to one that ignores satellite data in favour of doing statistical tricks with badly placed ground thermometers and relies on Russia to do things in space. Former NASA stars have been protesting for year at the dismal standards in NASA climate research. The same guys who walked on the moon, worked on the Apollo missions, and ran the shuttle program were fed up with NASA’s excellent brand name being exploited by junk scientists to do political promotions. Under Obama NASA was told to do three things -- inspire kids, help international relationships and help Muslim nations “feel good”. So much for space exploration and science. Obama slashed former President George W. Bush’s Constellation program, designed to take humans back to the moon and eventually to Mars, by leaking information to the press and threatening to veto the projects. NASA astronauts now rely on Russia to reach space, and NASA has been forced by the Obama administration to delay the Mars mission until 2030. 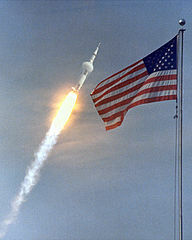 Apollo 11 Launch. Photo. 1969. Trump could slash the more than $2 billion NASA spends on its Earth Science Mission Directorate, which covers global warming science like improved climate modeling and weather prediction. Comparatively, NASA plans to spend roughly $2.8 billion on space exploration next year. NASA’s other functions, such as astrophysics and space technology, are currently only getting a mere $781.5 and $826.7 million, respectively. – from the Daily Caller, “Trump Will Scrap NASA’s Global Warming Research”. NASA always should have been the first and foremost agency to remind everyone of how important solar and astronomical events were on our climate. NASA could have killed the green machine stone dead anytime in the last 20 years. Capturing NASA GISS was one of the most vital of PR tools for the regressive-progressives to damp down any suggestion that the Sun has a big influence on our climate. Look at the way Brian Cox used NASA’s good name to mock Malcolm Roberts on national television even though Cox was absurdly pretending that NASA always produces perfect graphs and never gets anything, ever wrong. NASA has a “God like” status, above question. Or it did. That’s over. Can you imagine if the head of NASA had got out three of the guys who walked on the moon, Harrison Schmitt, Buzz Aldrin and Charles Duke and held a press conference saying that the links between the sun and our climate were recorded all over the planet. Imagine if NASA rolled out its prizewinning former employees John Christy and Roy Spencer to tell us how satellites showed the models were abject failures. If that had happened ten years ago, the world could have been saved billions (probably trillions) of dollars. When Lewandowsky got headlines claiming that skeptics are moon landing deniers, NASA could have got headlines that skeptics have walked on the moon. In so many ways, NASA can neutralize bad science. 24 hours is a long time in politics. So many commmentators still have no idea where Trump is coming from. A few fans of the man-made crisis got excited when Trump said “he has an open mind” on the Paris deal. (As if he would say his mind was closed.) But having an open mind is not an uninformed mind. He already knows enough to spot junk politicized “science” and shut it down. Hallelujah. Some commentators thought for a moment that he was “softening his stance”: Donald Trump just backtracked on man-made climate change: ‘I think there is some connectivity‘. That was so yesterday. Today his skeptical hand stomped all over that bubble. FRIEDMAN: But it’s really important to me, and I think to a lot of our readers, to know where you’re going to go with this. I don’t think anyone objects to, you know, doing all forms of energy. But are you going to take America out of the world’s lead of confronting climate change? SULZBERGER: Well, since we’re living on an island, sir, I want to thank you for having an open mind. We saw what these storms are now doing, right? We’ve seen it personally. Straight up. FRIEDMAN: But you have an open mind on this? TRUMP: I do have an open mind. And we’ve had storms always, Arthur. TRUMP: You know the hottest day ever was in 1890-something, 98. You know, you can make lots of cases for different views. I have a totally open mind. My uncle was for 35 years a professor at M.I.T. He was a great engineer, scientist. He was a great guy. And he was … a long time ago, he had feelings — this was a long time ago — he had feelings on this subject. It’s a very complex subject. I’m not sure anybody is ever going to really know. I know we have, they say they have science on one side but then they also have those horrible emails that were sent between the scientists. Where was that, in Geneva or wherever five years ago? Terrible. Where they got caught, you know, so you see that and you say, what’s this all about. I absolutely have an open mind. I will tell you this: Clean air is vitally important. Clean water, crystal clean water is vitally important. Safety is vitally important. JAMES BENNET, editorial page editor: When you say an open mind, you mean you’re just not sure whether human activity causes climate change? Do you think human activity is or isn’t connected? TRUMP: I think right now … well, I think there is some connectivity. There is some, something. It depends on how much. It also depends on how much it’s going to cost our companies. You have to understand, our companies are noncompetitive right now. They’re really largely noncompetitive. About four weeks ago, I started adding a certain little sentence into a lot of my speeches, that we’ve lost 70,000 factories since W. Bush. 70,000. When I first looked at the number, I said: ‘That must be a typo. It can’t be 70, you can’t have 70,000, you wouldn’t think you have 70,000 factories here.’ And it wasn’t a typo, it’s right. We’ve lost 70,000 factories. h/t Scott of the Pacific, AndyG, Angry, Pat.